SISTERS, OR -- A chimney fire spread to the roof of a Sisters home, Tuesday evening, causing about $5,000 in damage. Officials say a neighbor called 911, and the renters and pets safely evacuated the home on S. Cedar Street and put water on the shake roof before fire crews arrived. 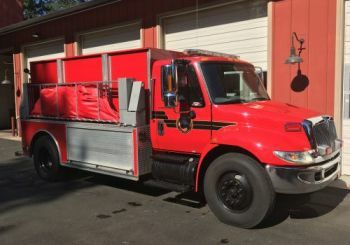 Firefighters from the Sisters-Camp Sherman Fire District quickly extinguished the blaze, which covered a 20'x30' area, but did not damage the living area of the home. They removed burned shingles and applied plastic to protect the building from the weather until repairs can be made. The cause of the fire is under investigation, but is believed to be related to the wood stove, which was in use when the fire started. There were working smoke detectors, but they did not alert because the fire was outside.